Moshos’ goal as a teenager was to become a manager at Dot’s. And over the years he worked in every department before moving up into management. Now that Moshos is the owner, the only thing that’s changed for him is he gets a lot more phone calls and emails. The original store, which was built in 1949 across the street, was called Bernhard’s. But the neighborhood knew it as Dot’s, a distributor whose name was emblazoned on a big sign. Two years later, Dot’s moved across the street to its present location, in suburban Kettering. Moshos said Dot’s is special because it has a hometown family vibe. 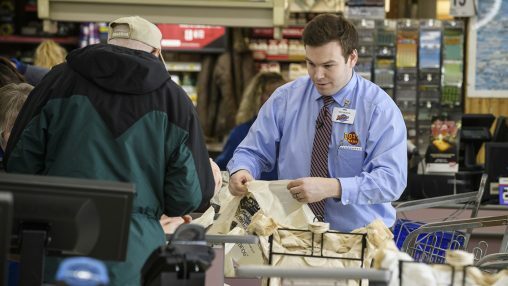 Robert Brown, grocery manager at Dot’s, said the store is kind of a throwback to the 1950s and ’60s with its family atmosphere and emphasis on service. Employees wearing blue fleeces with red Dot’s emblems beehive around the store, always on the lookout for a customer in need. Dot’s has many long-time, loyal employees. For example, Brenda works as a waitress in The Bull Pen Diner, a restaurant in the back of the store that specializes in cheeseburgers and all-day breakfasts. She has been at Dot’s for more than 30 years. Dot’s meat counter is a magnet for customers, sprawling more than half the length of the store and showcasing cuts of beef, chicken, chops and other meats. It serves as a social gathering spot, with clusters of customers trading bits of gossip as they wait for their numbers to be called. Moshos knows most of them by name and greets them accordingly. It’s a benefit of working at Dot’s for 11 straight years. The 16-year-old Moshos was encouraged to apply for a job at Dot’s by his father, who knew practically everyone at the store and as a self-employed carpenter inspired his son to someday own his own business. Moshos graduated from Carroll High School in 2010, earned an associate degree in business administration from Sinclair Community College, and transferred to Wright State to study human resources. He continued to work full-time at Dot’s, applying much of his earnings toward college. Moshos said the Wright State Raj Soin College of Business helped him develop his public speaking skills and taught him how to be accountable for big projects. He said Kim Lukaszewski, associate professor of management, would stay after class to advise him about going into business. He credits her with giving him the confidence to buy Dot’s. “It’s really helped me become what I am today,” he said of his Wright State experience. After graduating from Wright State in 2017, Moshos interviewed and applied for jobs in human resources. At the same time Moshos was looking for a new career, the owner of Dot’s, Robert Bernhard Jr., was looking to sell the store. Brown said that in his 35 years in the business, he has never heard of a bagger of Moshos’ age buying a grocery store. Nick Moshos still bags groceries at Dot’s from time to time. Moshos typically arrives for work at Dot’s at 7 a.m. There is no such thing as an average day. He just handles things as they come up, including the occasional bagging. As owner, Moshos plans to make greater use of social media to raise the store’s profile and connect with customers. He will also create loyalty cards so customers can accumulate purchasing points and will develop an e-commerce website that will enable customers to place delivery and pickup orders electronically through an app. Dot’s delivers to houses, apartments and even nursing homes. The drivers will even help customers put their groceries away if needed. 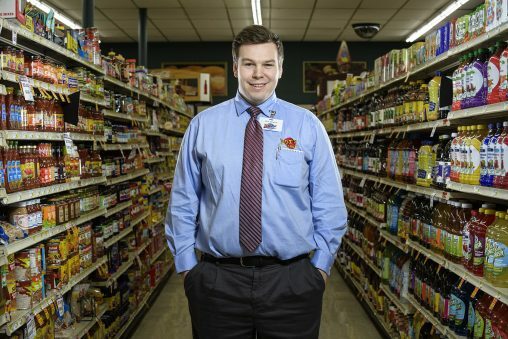 Moshos acknowledges that the grocery business in the Dayton area is highly competitive. He said Dot’s competes with the larger chain stores by using strong advertising and aggressive temporary price reductions. “We haven’t been run out of town and we’re here to stay,” he said. When Moshos isn’t working at a grocery store, he checks out other stores by going price-shopping around town. “I’m a grocery guru. I can’t help it,” he said.